The second-hand musical instrument and equipment market never fails to fascinate me. At a superficial level, it opens up opportunities to acquire instruments that you would never have the chance to acquire from established retailers. Beyond the surface, however, such encounters often come with the opportunity to meet new people, hear interesting stories, and make new friends. Within the few years that I have been purchasing and selling second-hand equipment, I have always found myself to be with good company and was able to widen my perspective little by little. Saying that each piece I buy from the second-hand market gives me new stories to tell and fragments of history to think about would be a mere understatement. Just a few days ago, I was on the hunt for a better classical guitar for my son, which led me to meet a man named Oliver Bugho. He had an ad posted on the popular buy-and-sell site olx.ph (formerly Sulit.Com.Ph) that described a vintage Japanese-made classical guitar, all-solid-wood construction (spruce top, mahogany back and sides, rosewood fretboard) for under $200. It seemed like a good deal so I requested for an appointment. I met Oliver last night after sending off my son to a vacation in Cavite with my parents. As with most of my second-hand-instrument encounters, it quickly became a getting-to-know-you session. I told him a little bit of my backstory and he told me his. As such, I discovered that he also knew some of the people I have encountered before like Japanese second-hand musical instrument dealer Marlon de Lara among others. It was also the debut of his musical instrument venture, something new for him after years of selling Macs as well as home theater equipment from Japan. After testing the guitar and chit chat, I got more than what I paid for. The guitar itself had a mysterious air to it. Oliver had previously sent the guitar to Mike Sison (critically acclaimed Filipino guitar technician) for assessment and minor repair. He said that Mike thought the guitar could easily fetch $250 or more. As I inspected the guitar, I saw that the sticker or label was entirely written in Japanese, Kanji I believe, and so I had no clue as to who made the guitar. It seemed like a hand-crafted piece rather than a mass-produced one, and it seemed to be that way as I played it. I knew that instant that I had a really good instrument in my hands and so I decided to buy it for my son. Oliver offered refreshments afterwards. I wholeheartedly and graciously accepted his hospitality. Over a few drinks, I discovered that Oliver specializes in computers (Macs) and was capable of selling them like hotcakes. He knew turntables, vinyl records, and audiophile equipment very well. He also considers himself a hobbyist solar energy technician (although he has done solar power installations professionally). We talked about a number of things such as music (he watched me play guitar as I tested his stuff and then played a little bit of Chick Corea’s “Spain” on a Yamaha PS-55), the politics of visual arts (e.g. painting, etc. ), a George Clooney movie about art, war games using air soft guns, a little bit of politics, etc. It’s worth noting that he hails from Tacloban hence he had very good insight as to what went on after the Yolanda tragedy (a topic for later writings I suppose). And so, how does this vintage classical guitar sound like? Here’s an unprocessed video clip featuring yours truly playing a rough sketch of a composition idea I have entitled “Dapit Hapon”. Now, it’s time for me to work on something else. Until next time. Saturday morning marks the last day of our Palawan trip. I just woke up with the sniffles (which I hope to be just the early morning one that fades as the day goes by) but it’s a good morning nevertheless. I hope that I would not have this feeling by the time we board the plane because it’s going to feel like crap if I do. In a few hours after breakfast, we’ll be leaving El Nido on another 7-hour ride to Puerto Princesa. Time to eat and get ready. And so I finally came back from dinner. We took a tricycle going from La Casa Teresa to the town square. We asked the driver where would be the best place to eat, and he recommended eating at Seaslug Bar & Grill. Upon arriving, I realized that we saw the place earlier this morning. It was the place that featured live musicians performing. Unfortunately, there weren’t any of them performing tonight. Oh well, we didn’t really go there just to watch some musicians play top 40 hits (like many of those who play around Manila). We were there to eat. Now, if you’re one of the few readers of this blog who happen to be vegan, now is the time to quit your browser and go read something else. We ordered a big bowl of “sinigang na hipon” (prawns and assorted vegetables cooked in a thin tamarind broth). In addition to that, my son ordered some spicy chicken wings, my wife had grilled pork, and I decided to be adventurous (again) by ordering sizzling croc. When I received my order, it was crocodile meat cooked as sisig (a famous Filipino dish popular in many local watering holes) atop an iron plate with raw egg and chilies. I mixed them all up with some Knorr seasoning, hot sauce, and calamansi juice. Now, how did it taste like? Just like chicken, nothing so unique or remarkable. Matter of fact is that I could probably be tricked into thinking it was chicken simply because my taste buds dictate it to be so. You can disagree with me if you like; perhaps you have more discerning taste buds than what I’ve got. The only difference is that if it were alive, it would not have any qualms about trying to eat me instead. Dinner was delightful. I ate until I was full, leaving me very satisfied with a smile on my face. It’s a very good and blessed day overall. I hope tomorrow will be good as well as we begin to make our trip back home. I woke up around 6:00 a.m., feeling refreshed after a good night’s sleep. It was relief from the horribly long travel time (7 hours) from Puerto Princesa to our lodging at La Casa Teresa, El Nido. It was the start of a new and exciting day of vacation sans electricity. The thing about the resort/beach town of El Nido is that it has a somewhat crappy power supply. Power is shut down from 6 a.m. to 2 p.m. It’s a good thing that most people (I’m talking about travelers and tourists) are outdoors during this time, many of which go on island hopping tours (like what we just did earlier). After taking a bath, my family (my wife and son) and I set out for our scheduled island hopping expedition. And so, what did we do on that journey? We swam numerous times at sea, exploring these breathtakingly picturesque places, the scenery of which is fitting for a hollywood movie in a tropical setting (something like “The Beach”). Per usual practice, we took lots of photos of ourselves and the scenery, and the we had lunch at the beach. The lunch, prepared by the boatmen themselves, included freshly grilled fish and pork belly, rice, cucumber salad, fresh watermelon slices, and bananas. Lunch was delicious. Our last stop on our island hopping journey was a trip to this island which had a bar that served drinks at really steep prices (around USD 4.50 for a mojito, USD 1.25 for a bottle of Coke). I don’t really know about the mojito but the Coke was priced about 5 times higher than you would purchase it at Puerto Princesa. This is quite understandable as I imagine it to be difficult and expensive to ship bottles of Coke from the mainland to that island. After the island hopping trip, we went to town to have a snack. We found this bagel place owned by a Frenchman. We decided to try it out. Each bagel sandwich was expensive, around USD 6.00 each. I ordered what they called a Brooklyn bagel which had bacon, mozzarella cheese, and lettuce, dressed in a sun-dried tomato and basil dressing (pesto). It was an expensive BLT but it was good. And so now it comes to this portion where I’m now back at our lodging, having just taken a bath, feeling all nice and fresh, and typing this blog entry, effectively killing time while waiting for dinnertime to arrive. It feels really nice to do this with an overlooking view of the beach and the mountains. Life is good and I feel blessed to have experienced this vacation time with my wife and son. My son and I woke up 12:00 a.m. to get ready for the trip. We picked up my wife at 1:00 a.m. and we proceeded to the airport. The plane ride went well, except that the altitude change caused some degree of discomfort in the form of mild sinusitis. I was expecting things to go well until we landed at Puerto Princesa Airport. The tour operator’s (La Attraccion de Turismo) driver picked us up, and I was expecting that he would then immediately drive us off to our accommodations. It did not happen. We had to wait for three other groups to show up. It didn’t help realizing that the van’s seats were built for ectomorphs only. The driver then drove us to the Puerto Princesa Coliseum to get permits for two other groups to get permits for the subterranean river tour. Rather than getting us settled and refreshed from our flight, the tour operator thought best to immediately send us to the underground river tour. It was the start of what seems to be one of the worst vacation experiences I was about to have. On our way to the subterranean/underground tour, we stopped by a roadside souvenir shop. I got some snacks and chose to ignore the usual touristy stuff. It was an opportunity to stretch. We then moved on. Upon landing at the port where we were supposed to take a boat ride to the underground river system, we had our buffet lunch. It was okay. My wife found it to be substandard. I liked the kilawing tangigue (mackarel ceviche) plus fried breaded assorted veggies. I also had the opportunity to have fresh tamilok (shipworm) served with lime juice, onions and chilies. It tasted like oysters with a hint of wood pulp. These clams are dubbed the termites of the sea in other countries. In Palawan, it’s finger food. So, if you want to get rid of your sea termites, hire a Filipino, more specifically a coastal Palaweno. The underground river tour is perhaps the best thing that has happened today. It was a wonderful, majestic, and pristine looking place. The river was so clean and clear that fish were abundant, even in its shallowest portions. This must be probably due to the place being a protected area by the government. It also helps that the place has been dubbed one of the new seven wonders of the world via an online poll. Our river tour boatman was wonderful. He functioned as the boatman, the tour guide of the underground river and cave system, and stand-up comedian. His jokes based on the cave’s structures and wildlife were spot on. Some of the other folks who were in the boat with us were half-wits, having questionable intellectual capacities. Anyway, I found the experience very fulfilling. We drove back to Puerto Princesa for *sigh* another opportunity to buy souvenirs. Snacks were of higher importance to me, and so I chose to buy those, something that my wife did as well. 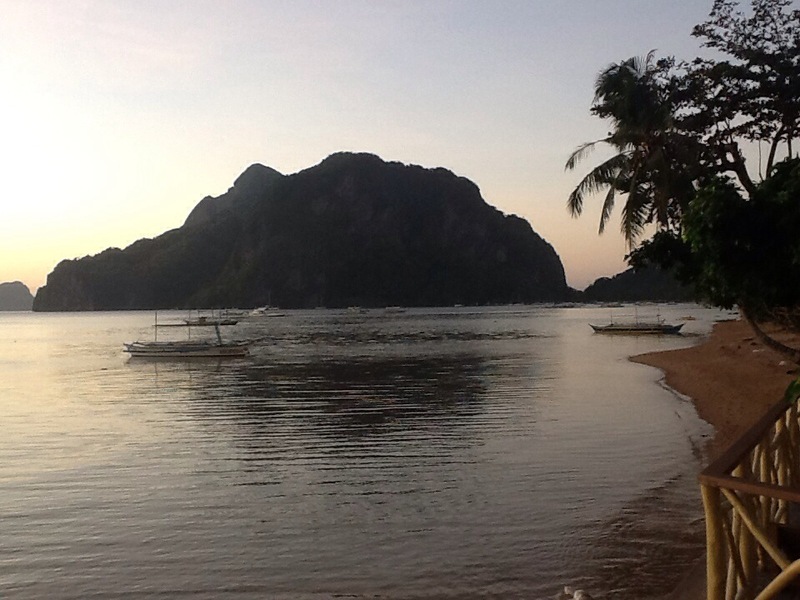 Afterwards, we met another driver who then drove us off into our accommodations at El Nido. The five-hour drive was less than desirable. Finally, we got into our room. It had automatic air conditioning beyond our control, had no power outlets for our gadgets, and no hot water. At least it was a place good enough to sleep in. Although this first day seems to be lacking in some spots here and there, I’m still thankful for this trip. It’s a privilege to be able to go and do so. I do hope tomorrow would be better. Hey folks! It’s that rare time of the year where I get invited to perform at a concert. Rev. Ruth Billena invited me to play guitar with an ensemble for this year’s LCSMC concert. Last 2013, the Lowland Cavite-South Manila Conference of the United Church of Christ in the Philippines invited me to perform at a concert entitled “Musicalitea in Unity” (I hope I got the title correct). Held last September 2013 at the Philippine Christian University Auditorium, I performed as a pianist for a trio (with Pastor Abong Romero on classical guitar and Chay Innocentes on vocals), covering the Filipino Christian classic “Hesus”. I also managed to squeeze in a solo piano performance of my composition entitled “Promises”. This year, on March 8, I will be functioning as one of the guitar players of a stringed instrument ensemble organized by Rev. Ruth Billena. I will be performing with my usual musical co-conspirator, Pastor Abong Romero (steel-string Yamaha Silent Guitar), as well as with Pastor Joel Gervacio (classical guitar), and Edwin Mariano (violin). 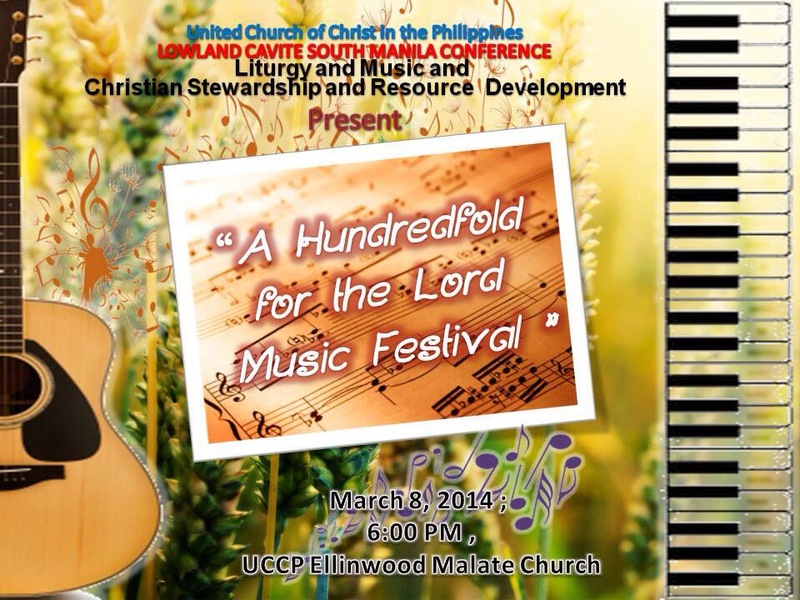 We will be performing at the “Hundredfold for The Lord Music Festival”, March 8, 2014, at UCCP-Ellinwood Malate Church’s main sanctuary. Rehearsals have been great so far, and I am really excited about performing at this event since it has been more than 10 years ago since I last performed at Ellinwood. It’s been that long! Anyway, if you are one of those people who have stumbled upon my post and will be in Ermita or Malate, Manila on the afternoon of March 8, please drop by and enjoy a wonderful p.m. of music with our ensemble plus the rest of the people who will be there. Tickets will be sold at the door for Php 300. Bring your friends, family, and loved ones and, at the very least, realize how wonderful is God’s gift of music to mankind.